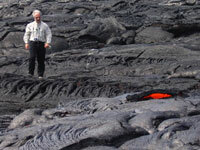 Investigates the hidden forces that drive the planet's largest and most active volcanic system, the Hawaiian Islands. HAWAII: ROOTS OF FIRE is a new documentary about the hidden forces that drive the planet's largest and most active volcanic system, the Hawaiian Islands. The film follows earth scientists as they work among the volcanoes of the Big Island Hawaii, pursuing clues and compiling evidence in a quest to shed light on the mysterious inner-Earth process that has been producing giant volcanoes in the middle of the Pacific Ocean for more than 75 million years. Scientists have long been puzzled over the source of the huge quantities of lava erupting out of Hawaii's massive volcanoes. Does the lava come from just below the Earth's crust? Or does it come from much deeper, perhaps even as far down as the Earth's core, some 1,800 miles below the surface? The film focuses on an international team of scientists who take on these key questions with a major drilling project into the flanks of Mauna Kea, Hawaii's tallest volcano. After years of painstaking research, startling new discoveries are made. Not only have the scientists determined where the lava is coming from, but they have solved other long-standing mysteries about the workings of Hawaii's magnificent volcanoes. This project was funded by the National Science Foundation Continental Dynamics and Informal Science Education Programs. "Hawaii: Root of Fire combines beautiful footage of Hawaiian landscapes with the impressive artistic reconstructions of the Earth's deep interior to tell the remarkable story of the geological mechanism that feeds the Hawaiian volcanoes. Hidden within Earth's mantle, there is a deep plume of hot and partly molten rock known as a hotspot. This is a fascinating geological phenomenon that has only recently attracted the attention of earth scientists. This entertaining and educational film is a must-see for both students and educators in the earth sciences." "Excellent presentation on the causes of volcanoes in Hawaii and the modern theory of mantle plumes. Interviews with prominent scientists are suitable for middle school students to the adult public." "The film provides a clear and compelling explanation of the research questions and the approaches used to address those questions, through a combination of concise narration, interviews with leading researchers, and excellent visual graphics. The outstanding footage of Hawaii and its eruptions add to the quality and engaging nature of the documentary. This film will be useful for a range of education and outreach efforts aimed at teens and adults." "An extraordinary documentary...Hawaii: Roots of Fire is as educational as it is fascinating. Highly recommended especially for public and school library collections." "Recommended...wonderful footage...The animation sequences built around the explanations and the scientific evidence are astounding. Sure to please the viewer, a lot of information is packed into the 27 minutes of this film. I highly recommend this DVD for jr. high audiences and above science classes--great to watch and fun too!" DVD features include SDH captioning for the deaf and hard-of-hearing, and scene selection. America's turbulent geologic story and earth scientists' biggest push yet to uncover its deepest secrets. The danger posed by the New Madrid earthquake zone along the Mississippi River. Geological discoveries in the Pacific Northwest. Pakistan's fast-growing mountain, Nanga Parbat, challenges geological theory. "Well filmed with clear narration and exciting footage of the volcano, and it gives a sense of how scientists approach a topic as vast, hidden and complex as the workings of the Earth's interior." "[An] engaging examination of the origins of the Hawaiian Islands. Useful for earth science classes." "This video explores the way Earth scientists work, how a theory is assembled from evidence, and how the work from many different fields and people contributed to the understanding of the island chain...The convergence of investigative methods from a variety of fields shows how physics, chemistry, and geology each contribute pieces of the puzzle...The many questions that arise from viewing the film may lead students to their own research question."